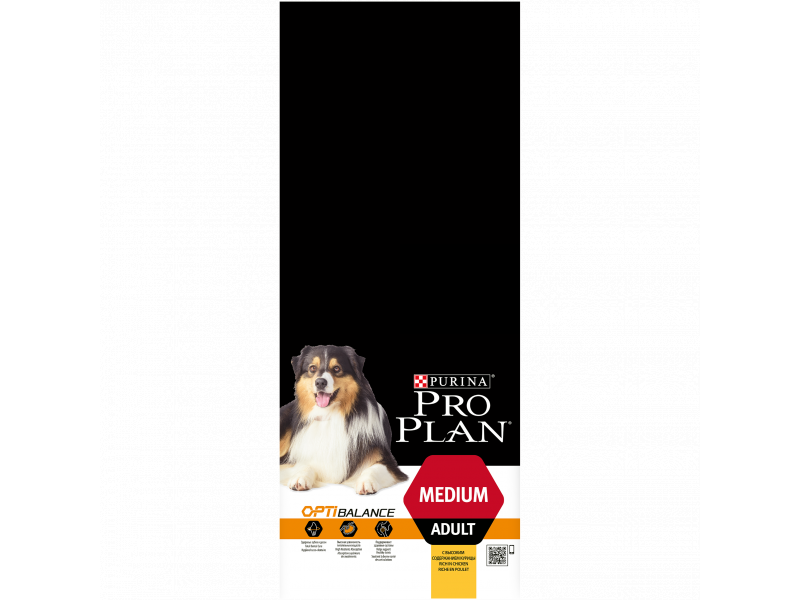 PURINA® PRO PLAN® DOG Medium Adult with OPTIBALANCE™ is a complete dry dog food designed for the needs of medium-sized adult dogs. This dry dog food is rich in chicken, and it has been formulated to meet all of his nutritional needs as part of a healthy lifestyle. OPTIBALANCE™ is a combination of specific nutrients that are balanced at levels to help keep your dog healthy.This dry adult dog food is formulated for total dental care. It helps support healthy joints for their active lifestyle, and it can help keep their coat shiny from root to tip. Rich in chicken, PURINA® PRO PLAN® DOG Medium Adult with OPTIBALANCE™ ensures that your dog gets all the nutrition he needs from mealtimes so he can live life to the full. IU/kg: Vit. A: 28 000; Vit. D3: 910; Vit. E: 550; mg/kg: Vit. C: 140; Ferrous sulphate monohydrate: 230; Calcium iodate anhydrous: 2.9; Cupric sulphate pentahydrate: 46; Manganous sulphate monohydrate: 110; Zinc sulphate monohydrate: 390;Sodium selenite: 0.27.Technological additives: Tocopherol extracts from vegetable oils: 36mg/kg. There are currently no questions for Purina Pro Plan Medium Adult with OPTIBALANCE Dog Food - be the first to ask one!